The Alberta Union of Provincial Employees (AUPE) has reached a tentative four-year deal with the province, following months of negotiations. "We now have a tentative agreement that we can recommend to our members for ratification with our heads held high," AUPE President Guy Smith said in a statement released Monday afternoon. 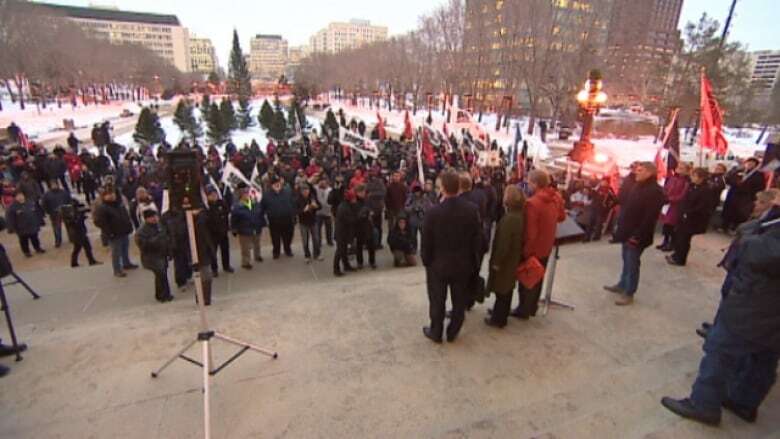 "With this agreement, the government has taken a positive first step towards rebuilding trust with AUPE. I recognize our members' trust in the government is still badly damaged and won't be repaired overnight, but this is an important move in the right direction." The bill, which received royal assent in December, would have imposed a wage settlement with a two-year pay freeze if the province and the Alberta Union of Provincial Employees could not reach a negotiated settlement by the end of January. It would have also taken away the union's right to take disputes to an arbitration board. The legislation was put on hold in February by Court of Queen's Bench Justice Denny Thomas pending a further review of concerns voiced by AUPE. The Alberta Court of Appeal was prepared to hear arguments Monday on why they should overturn the decision by Justice Thomas. But government lawyer Hugh McPhail advised the three Appeal Court justices that he was adjourning the case without setting a future date. McPhail did not give a reason for the adjournment. He told the justices "the situation should be clear in a couple of months," but did not elaborate. AUPE was given binding arbitration decades ago as compensation for legislation removing its right to strike. The union told Thomas the law is unfair and deals a fatal blow to its ability to bargain. In his written decision, Thomas said the act "guts the bargaining process by removing an effective leverage on the part of the workers, who as a result of other provincial laws (that ban their right to strike) cannot withdraw their labour. "The effect of the legislation is to emasculate the AUPE … Alberta did not meet its obligation to negotiate in good faith." Dave Hancock, then deputy premier and now the premier, announced in February the government would appeal Thomas's ruling over errors in fact and in law. Then-premier Alison Redford said the law was necessary to match similar wage deals signed by doctors and teachers to help balance the budget. The union represents more than 22,000 government staffers, from social workers to prison guards. Workers have been without a contract since March 2013. The two sides are still talking, but no agreement has been reached. Last year, Redford's government also passed a second bill imposing severe six and seven-figure fines and sanctions on AUPE if it launched illegal strikes. The salary restraint law is just one flashpoint of discontent between Alberta and its public-sector unions. Hancock's government is also debating this session a bill to revamp public-sector pensions to keep them sustainable as the population ages. However, unions say the pension systems are on track to erase $7 billion in unfunded liability. They say the revised law will see staff working longer for less pay and they are particularly concerned with the plan to do away with mandatory rules for pensions to keep pace with inflation.